When Liz and I first bought our house, it included a wonderfully horrid attempt at a wet bar in the basement. I’m sure that who ever built it thought it was beautiful (much like how all parents think their babies are beautiful). It had some absolutely stunning bead board from the local home center plastered across the front, and some sort of laminate applied to the plywood top. They had gone to the effort of putting in drywall on the back side, and an itty bitty sink. The sink isn’t terrible, at least functional, but on the smallish side. Somewhere along the line Jim (dear old best friend Jim, who has probably encouraged more than a few irrational ideas) and I thought that we could do better. Liz and I had decided to completely redecorate the basement after our last bout with water from a frozen pipe, and didn’t want an ugly bar to detract from the rest of the basement. Paint was applied generously, carpet removed and replaced with vinyl stickers that look like wood, and the bar was judiciously destroyed. We left the 2×4 frame and painted it black. The new basement was all about things being black, and dark, and awesome. And nothing is more awesome than black. With an epic black 2×4 frame, more wood was applied. A skin if you will, of rich brown birch plywood. This time we only applied this to the outside face of the assembly. We wanted more storage on the back side, and had some crazy ideas about how to make it happen. Upon our skin a black oak trim was applied. It was black, and oaky, and deep, and dark. Unfortunately we also discovered how hard it is to get wood to be perfectly black. Go to your local home center and look for stains (not paint) that achieve a full uniform black as night look. Back already? Hard to find. You might have stumbled across stains labeled as ebony. This is but a mere illusion of deep, and dark, and black. To fully achieve black you need two things, pure black dye, and india ink. India ink is officially the blackest thing I have ever found. Light is absorbed to never be seen again. So after much blood sweat and tears we had black trim, and it was applied, and It. Was. Awesome. 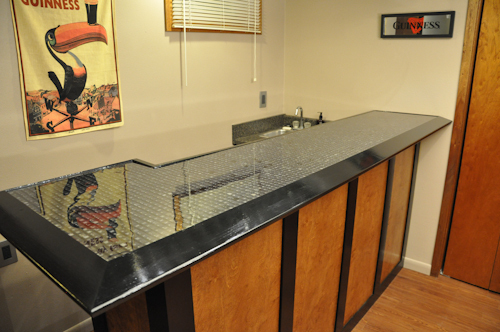 But this left us with a quandary, this epic, dark, black bar needed an appropriately epic top to match it. Since Liz and I are children of the internet, we plumbed the depths to find something, anything to fulfill our bar top needs. Liz found a nifty little end table that someone topped with dominoes. Gears churned, wheels engaged and squirrels sped forth into the night with a previously unknown passion. We could put things in the top. Our minds raced with the possibilities, dominoes were cool, but already done. Coins and bottle caps were so last decade. We needed something original, something truly epic, and us, and never before seen. Enter ISU Surplus. The mecca of all things scientific and discarded at ISU. Here there were all sorts of electronic gadgets which could be embedded within a resin tomb. We had been collecting nifty circuit boards from which we were going to build a sculpture, and we thought about using some of those. Unfortunately to cover the top of a bar, you need some fairly significant square footage. I don’t know if you’ve noticed, but electronics are continually getting smaller, and thus circuit boards keep getting smaller with them. What else do people get rid of, but hasn’t been getting smaller over the last decade? 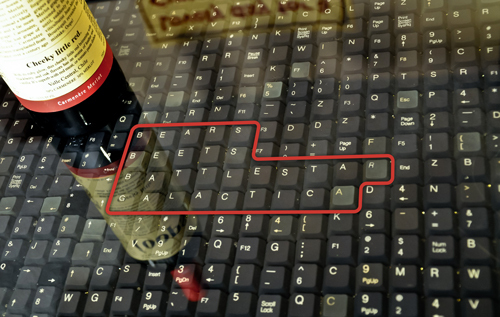 The lowly keyboard. And not just any keyboard, but the most generic black keyboard that has been more mass produced than even iPods. Yes, 55 of them in all were procured. You see, keyboards have a wonderful array of perfectly square keys. They are even labeled with their function. Plywood was cut, trim was attached, and we had a void to fill. As I mentioned earlier, we had 55 keyboards. If you count the number of square keys on your keyboard you will come up with something in the ball park of 80. This isn’t a small number (for those who are bad at math, 55 * 80 = 4400). Weehee!! That is a lot of keys to individually place in an upright fashion while creating some sort of pattern. 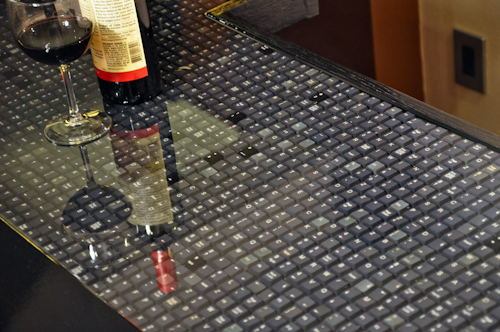 Speaking of patterns, what kinds of patterns can you think of creating with keyboard keys. I’ll give you a moment. I’m sure you didn’t think of something as awesome as we did. A word search. I’ll repeat that. A word search. Getting drunk will never be the same again when you can entertain yourself and friends by trying to find crazy things in front of your face. I’m sure people look ridiculous while searching for hidden text, but we are having a fabulous time drinking, so it doesn’t matter. As you can see here, keyboard keys are small, and as I mentioned earlier, there is a lot of space to cover. How does one go about creating such a behemoth of a word search you say? One might expect to plot out each individual key with graph paper to maximize the level of fun that could be contained per square inch, thus achieving unheard of excitement. But then you just start hacking away at it because you’ve already put down three beers and need somewhere to set your bottle sooner rather than later. Fortunately Jim and his wife Mariah were drinking with us that night and we talked them into helping us lay everything out. 16 hours later the keys had been placed. I am actually serious about 16 hours of placing keys. Each one being hot glued down to prevent it from being knocked over as we poured out the resin fill. Many, many nights I sat hunched over the bar. Glue gun in hand, the smell of my burning flesh filling my nose. Placing each. Little. Key. Soon you start to see letters floating all around you, swirling and cascading down. They make such a pretty sound when they are being poured out. Like a cascade of shards of glass coming towards you. So there we were, a sea of keyboard keys secured to a piece of plywood. To gaze upon it was to know awesome. The keys each had a different pitch to them which made the entire surface into an undulating sea of keys. Unfortunately it made for a horrible surface to place a drink on. Bottles kept falling over, things got lost in the crevices (imagine your couch cushions, but times a 1000. There must be a small fortune in pocket change in there.) and it just generally wasn’t as awesome as we would like. Enter large volumes of resin. Ugh, I guess you want a better explanation than that too. What most people think of when you say epoxy, is some two part adhesive that sticks any two things together. Now imagine that in larger quantities, like on the order of gallons. What you probably didn’t notice when working with your dainty little adhesive, is that epoxy is an exothermic reaction. For those without an engineering background, that means it produces heat. Enough to melt plastic, burn your hand, and generally cause lots and lots of problems if you try to play with too much at one time. For the spacial minded people, you are probably thinking about the volume that these keys take up. Your keyboard is much like an iceberg, there is a lot below the surface that you don’t see. The keys we used sit almost an inch tall. At almost 11.5 square feet that is 1656 cubic inches of volume to fill. Keys are a whole lot of air, much like many of our leaders, and thus don’t really take up much useful space. A gallon is defined as an 8 inch cube, or 512 cubic inches. With some magical math we end up with 3.2 gallons to fill the volume. Thats a lot of tubes of JB Weld. When working with commercial volumes of resin you must take your time. You pour out an eighth of an inch at a time. You mix till your arm goes numb. You cry to the heavens for salvation from this agony. Then you realize that you already spent 16 hours placing itty bitty little keys by hand, and you succumb to the realization that it is winning. The project is beating you. At last, the liquid reaches the top. You are done. 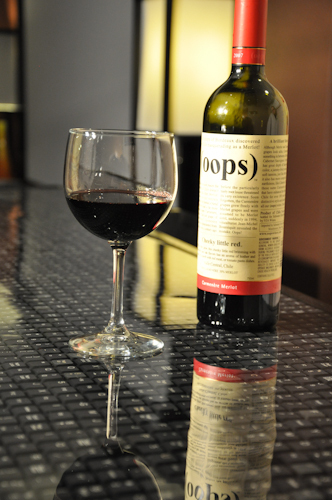 Pour yourself a glass of wine, you might as well enjoy what is left of your sanity. Unhappy is an incorrect term to associate with my feelings. Loss of sanity (if that can be called a feeling) would be more appropriate. I would be lying if I said this project was a walk in the park. This table is so cool! That surplus sale was quite the score. Definitely send me a link to your chair and loveseat when you have a chance to reupholster them. I thought that during the resin phase there was some type of leak…or am I remembering something wrong? Yeah, leaks were a serious problem. It has a real tendency to screw up the floor. the other major problem was things being perfectly flat and level. Water and other fluids seek their own level. Even if that level doesn’t agree with what I want to be level.